Heh, well, it’s a funny story actually. I’d intended to replay something a little more modern for this feature, and what Xbox One game is bigger, both in stature and in sheer size (70.4GB and counting), than Halo 5: Guardians? But the truth is, I couldn’t finish the fight. In fact, I barely managed to get as far as cracking through the glass of the Argent Moon before becoming overwhelmed by powerful ennui. It isn’t the action that is found wanting, although Halo 5’s campaign is one that is fun almost despite itself. Rather, standing in a lift listening to yet another dreary monologue from one of the Chief’s faceless supporting cast, it struck me how utterly, depressingly awful the storyline is at character development. Six (six!) new characters are introduced during the opening two levels of Halo 5’s campaign, and broadly speaking, we know as much about them at the start as we do when the end credits roll. Oh, we get backstory by the bucketload, with the likes of Linda (or is it Kelly?) spouting exposition whenever lulls in the combat allow. But although we learn of them, we never learn anything about them. Whenever the plot heats up, Linda and the lads get shunted into the backdrop, and we never get a chance to learn what drives or motivates them, or how they react when there’s a gun to their heads. It’s a sad state of affairs really, because if you think back to the original Halo: Combat Evolved, every character – The Chief, Cortana, Guilty Spark – was clearly defined and larger than life. Bit-players have to be allowed their moment in the sun if we’re to care about their fortunes – as an example, Dom Santiago’s evolution from jock meathead to tragic hero across the Gears of War arc is surprisingly well done. But for a world-class example of a shooter that manages to make you really care about the fortunes of your squad, look no further than Sega’s Binary Domain. Now, for whatever reason, Binary Domain was a commercial flop. Maybe it was the thrilling-like-tax-returns name, or that it wasn’t well distributed. It doesn’t matter: hunt it down, because it’s genuinely one of the most satisfying shooters you’ll ever play, with robo-enemies that shatter when shot in a way even games wouldn’t dare replicate with flesh and blood. But as good as the gunplay is, it’s the people you shoot with, not at, who live longest in the memory. 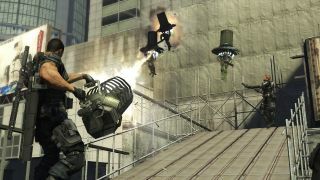 Director Toshihiro Nagoshi, creator of the Yakuza series, wanted to create a shooter where your teammates’ personalities took centre stage, and in telling the tale of Dan Marshall and his thrown-together Rust Crew, he was hugely successful. Binary Domain’s is a sillier world than that of Halo or Gears of War (one of the members of your crew is a gun-toting robot with a comedy French accent), and yet it also contains moments of great poignancy. Most impressively, it manages this with a cast that appear to have been selected from a mail order cliché catalogue – such as Big Bo, your ‘woo-ha’ bestie, and Charles, a sour Brit who immediately has you pegged as a bit of a wanker. Yet as our relationship with them grows and develops, we bond with them through action rather than dictation. And then there’s Faye. Mysterious, strong-willed Faye. It’s no spoiler that she ends up as the love interest. There are blind cave-fish cut off from the rest of the world by six metres of Antarctic ice that saw Dan and Faye’s lip-lock coming at the story’s halfway mark. But what follows isn’t for spoiling, as a revelation rocks your team to its core, and practically demands that rifts develop. What happens next is up to you. Binary Domain’s story is largely linear, but the ending – and who survives – hinges on how much your crew trusts you. Trust is a stat that has to be managed across your team, and getting them all to a high trust level is a massive undertaking. Most variables – such as the tactics you bellow during firefights, or responses to conversations during quieter moments – have the effect of raising the trust level of some squad members while decreasing it in others. Cleverly, trust also bleeds into combat; efficiently cleaning house raises trust across the board, while friendly fire has disastrous results. In this way, every line of dialogue and every shot fired in Binary Domain matters. Not only are your teammates’ fates entwined with your actions, but the plot gives you every reason to care. Quite the contrast with Halo 5’s awkward dialogue. As we sit in the lift, listening to Kelly (or is it Linda?) witter on unprompted, The Master Chief has never looked so alone.